Thailand is a vast country that covers an area of over 510,000 square kilometres. Due to the strange and irregular shape of the country, its main residential hotspots are spread out over a large area. Chiang Mai in the North, Phuket off the South coast, and Bangkok and Pattaya between the two. Also popular for foreign investment is Hua Hin and Koh Samui. More about these later. 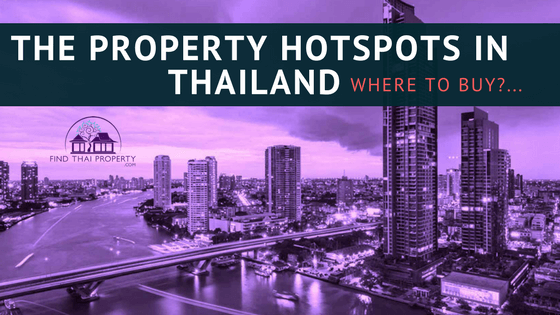 This diverse landscape and dispersion of the country’s population mean that choosing a location to purchase a property can often be confounding – which areas in Thailand are considered the best for property? Which cities have the best infrastructure? Which regions offer the best in terms of work opportunities, recreational pursuits and return on investment? The following is a list of prime property locations in Thailand, together with their unique selling points. Bangkok is obviously one of the most attractive and popular locations for property investment in Thailand – and deservedly so. With a population of over 14 million people, it is one of the largest cities by population in the world and is the political and economic centre of both the southern region of Thailand and indeed the whole country. Bangkok has so much in its favour as a location to live – there is an abundance of employment opportunities, the public infrastructure is fantastic and ever-expanding, there is a whole host of attractions and historical sites, and there is also a large supply of quality property to suit all budgets. Chiang Mai is the largest city in the northern region of Thailand and presents a different atmosphere to Bangkok and also a different climate. This city has an extensive history and has some fantastic cultural sites, public facilities and a range of quality properties. Notable areas include the Old City, the Riverside and the Night Bazaar. Furthermore, as Chiang Mai is the second largest city in Thailand, it has a strong economy, and the Thai government continues to invest heavily in its infrastructure. This city has a large variety of detached properties and townhouses, together with a wide range of condo developments. Bangkok offers mostly condos and apartments. You can find a range of 3 and 4 bedroomed townhouses for sale at reasonable prices (often for less than what you would pay for in the capital) but as a foreign investor there will be restrictions on land ownership. Pattaya has somewhat of a bad reputation for being the party capital of Thailand – it is known by tourists as a location for a hedonistic nightlife scene. This is only a small portion of this beautiful coastal city however and Pattaya does have a lot to offer if you look closer. Pattaya maintains a strong infrastructure and economy due to its tourist industry, and as this grows, so will the city and its facilities. In terms of recreation and attractions, Pattaya has some sublime beaches and an array of cultural sites such as Wat Khao Phra Bat Temple and the gorgeous Sanctuary of Truth. Due to its coastal location, Pattaya property market generally consists of condos and high-rise apartments. You can find some truly sleek and modern apartment blocks and condo developments for unbelievable cheap prices. Last but not least we have Phuket! Phuket is a true island paradise and although it sits at the southernmost edge of the western part of Thailand, it is still an attractive location. An overriding factor in the popularity of Phuket as a place to live is the sheer amount of investment the Thai government has poured into this area. Since the 2004 Tsunami, the island of Phuket has been extensively developed and now boasts some superb infrastructure, amenities and property developments. Phuket benefits from an eclectic mix of apartments, townhouses, and condo developments all with reasonable prices. Where is it? Hua Hin is roughly 200km from Bangkok and a 3hr car journey depending on traffic. It is a popular coastal destination for local and international tourists. It provides many of the home comforts in terms of restaurants, shopping and high end hotels. As a lifestyle purchase we can see why Hua Hin appeals. Living on a tropical island is many people’s dream. For lifestyle buyers Koh Samui is an attractive proposition. There are gorgeous beaches aplenty, restaurants galore and a vibrant expat community that has decided to invest their savings into a property here. It has its own airport and sees a large number of tourist arrivals because of this. For people looking to live and work in Thailand, opportunities are limited on Koh Samui in comparison to Bangkok and Chiang Mai. Public transport on the island is limited, but the purchase of a motorcycle or car can aid mobility. Many properties in Koh Samui are either condos, or beachside villa resorts. There is a range of mid to high-end property. The rental market is prone to large seasonal swings. As you can see, there are several key areas of property investment in Thailand. However, our experts top choice is Bangkok. There are airports that facilitate travel to anywhere within Thailand or further afield, great infrastructure, a vibrant rental market, and land prices continue to increase. As with most capital cities in the world, Bangkok gets the lion’s share of investment, provides the best employment opportunities and is attracting huge foreign investment and tourism. It is currently the most visited city in the world. While there is no doubting that there are other appealing places to live in Thailand, in terms of property investment they don’t provide the same opportunities as Bangkok. However, for lifestyle buyers this may not be a primary concern. Need more information on Thailand Property? Thailand property service for international clients. Full pre and after-sales support for overseas property buyers. We are a real estate agency based in Bangkok, Thailand.